Posted on 08/31/2018 by Mickey McCarter	in Live Review and tagged anniversary show, Baltimore Soundstage, England, goth, industrial, Killing Joke, post-punk. English goth rockers Killing Joke are celebrating 40 years with a 40th anniversary tour, and they perform at Baltimore Soundstage on Monday, Sept. 10. 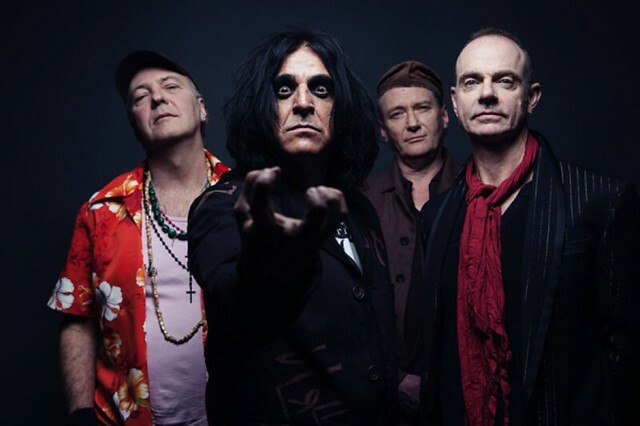 Killing Joke consists of founders Jaz Coleman (vocals, keyboards), Paul Ferguson (drums), Geordie Walker (guitar), and Youth (bass), along side Reza Uhdin, whose been playing keyboards with them since 2005. The band released a 15th studio album, Pylon, in 2015 via Spinefarm. Although it got some pretty good reviews, Killing Joke remain best known for their early output, including their 1985 hit, Love Like Blood, from fifth album Night Time. Jaz and Geordie kept the band alive throughout some lineup changes since 19798, but in 2009, the original lineup reformed to record for Spinefarm Records. With Spinefarm, Killing Joke released Absolute Dissent in 2010, MMXII in 2012, the Singles Collection in 2013, and Pylon in 2016. “Killing Joke deserve a list of their own. For nearly 40 years, the Brits — iconoclasts, Dadaists and humanists in equal measure — have perverted and bestialized metal and punk for their own pleasure, infusing grinding riffs with industrial sterility, cold New Wave vocals, and synth soundscapes that actually sound tough. Though their sound is decades old, it’s evident in no shortage of contemporary bands, including Foo Fighters, Faith No More, Tau Cross, and Pinkish Black,” said Rolling Stone of the band in 2015.